The ultimate throwback! 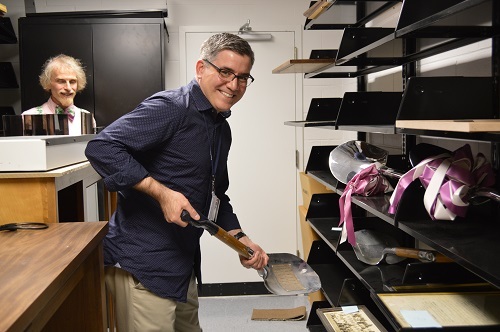 Rob LeBlanc, First Year Experience/Humanities Librarian, maneuvers the shovel used at the ceremony to break the ground for the Library Building, Chemical Engineering Building and the U.S. Navy R.O.T.C. building on Wednesday, January 22, 1947. Check out the Villanova University Archives, housed in Falvey’s ground floor, for additional documents. For more information, contact Michael Foight, Digital Library and Special Collections Coordinator.